On September 23rd 1974, the Doncaster-born Liverpool football star married his childhood sweetheart, Jean Woodhouse, at St Peter's in Chains Roman Catholic Church in Chequer Road, Doncaster. Unlike todays celebrity-style wedding's there was a certain lack of fanfare, fans, celebrity guests and tabloid/magazine photo deal. Their wedding was shrouded in secrecy, and since then they have managed to keep their private life private. The Daily Mail reported "Kevin was just 24, his bride a year younger. Watching them with a tear in their eyes were his proud parents, Joe, a miner, and Doris." 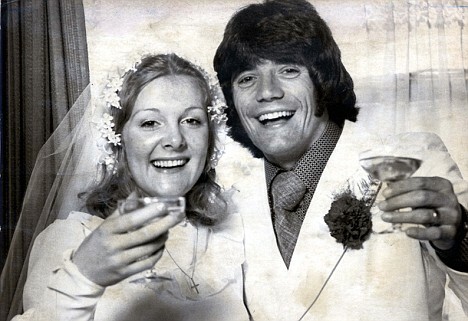 Kevin said at the time: "Jean and I hadn't planned to get married for months, but I had a five-week ban for fighting with Billy Bremner and, as they say, every cloud has a silver lining, so we decided to use the time to get married quietly." He met his bride when she was 16 at a fairground while he was a trainee at Scunthorpe Utd, telling her he was a steelworker so she didn't think he was too 'flash'. His transfer fee to Liverpool was �33,000, and at the time of his wedding he was earning �100 a week. He celebrated by splashing out on a �2,000 Datsun. There has never been anyone else for him but Jean Woodhouse, whom everyone in the sport believes is his rock. They still have family in the Doncaster area.